FIRENZE. For the second look I created during Firenze 4-ever I decided to go for this magnificent, textured Giambattista Valli jacket that I fell head over heels in love with (a romance that left me heartbroken after seeing the price tag, mamma mia!). I paired it with a simple Alexander Wang skirt to give the look more of a downtown feel and topped it off with the bright Casadei shoes, a black proenza schouler bag & Céline sunnies. Totally considering a DIY attempt on this jacket, it’s simply too stunning to go without! GIAMBATTISTA VALLI jacket. T BY ALEXANDER WANG skirt. 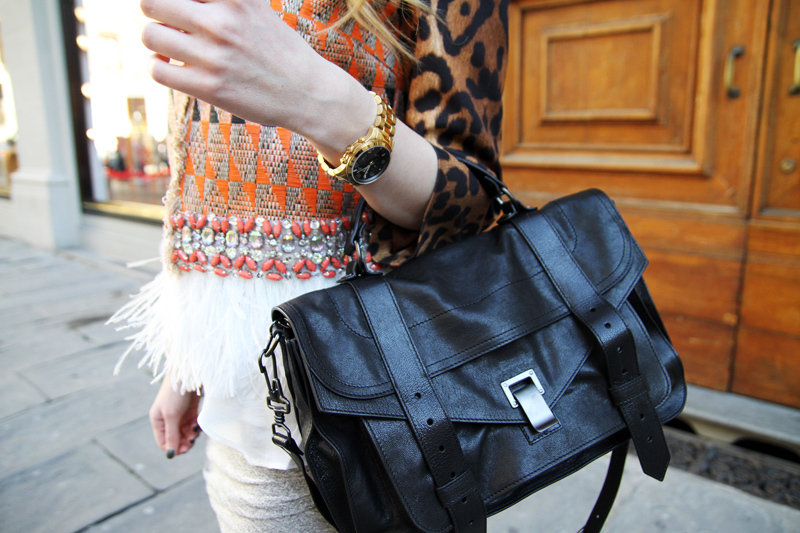 PROENZA SCHOULER bag. CÉLINE sunglasses. MICHAEL KORS watch. CASADEI shoes. This entry was posted in Collaborations, Outfit and tagged fashion blog, firenze 4-ever, Giambattista Valli, Outfit, Proenza Schouler by Carolina Engman. Bookmark the permalink. the jacket is really beautiful! love the look! that jacket really is stunning! This jacket is really intriguing, I love the way you wear it!And the shoes….!!! I love the jacket and shoes. so amazing. Love everything!!!!!!! Perfect outfit and your legs are to die for. Very beautiful. Love the jacket on you. Stunning look ! This jacket is amazing ! All the outfit is gorgeous ! You’re right, that jacket is very beautiful!! Love the Alexander Wang skirt too!! I want to follow you through my blog, how can I do that?? So pretty and feminine! I love this look, esp. the jacket! Amazing look – those shoes are perfect for that jacket! The outfit is great! I love the jacket, but I can also imagine the huge price. It’s so sad, that the most beautiful things always have to be that expensive. ABSOLUTELY AMAZING JACKET! Especially in combination with these pair of lovely sandals and bright Coral colored lips! A blog driven by (upcoming) fashion stylists who give you free, personal style advice based on your Facebook profile. amazing look! that jacket is just stunning! Really inspiring look!! You look gorgeous ! omg gorgeous jacket! and i love the lighting in all the photos, so natural. The jacket is so beautiful !!!!!!! You look gorgeous!! That jacket is simply amazing!! A DIY attempt would be a great idea. Such a lovely look in a beautiful place!! You look stunning! love your jacket! Awesome look. That skirt looks really great and comfortable and that bag and shoes…wow!! Love this outfit – it’s so chic and perfectly put together with a fun twist. I’m obsessed with the jacket. Love this selection of photographs! The Celine sunglasses are my favourite. What a wonderful outfit. Much love, from England. Gorgeous – the Giambattista jacket is stunning and I love it with the skirt, sunnies and PS1! p.s. your hair looks amazing! That jacket is fantastic ! Really love it ! This look is so beautiful. Love the jacket and the shoes. Absolutely love this outfit! Great combination with the AW-skirt! Love it! Those are my old stomping grounds…miss Florence so much! a very beautiful outfit! i love this jacket! Love your style and your hair! look amazing! love your shoes so much. that jacket is incredible! and of course the proenza bag. pure perfection! The first image is perfection…as are those heels! Absolutely gorgeous and sophisticated! You definitely need to do a DIY, it’s a most have. i kinda want to attempt a diy on this also.. it’s beautiful. This jacket is very eye catching ! If you do a DIY, please show us how. I would love to see how and whatyou do. The jacket is such a beautiful piece! God, what a nice pictures. I’m longing for the summer right now…. Really great outfit – love your jacket… wonderful! You are very well dressed ! You look amazing, very chic! I love the whole outfit!! For a touch of men’s fashion! Love the shoes! and the skirt! Wauuuw, dat jacket is indeed absolutely awesome!!! You look gorgeous! And I love the outfit! You look gorgeous. Love the jacket. amazing photos ! love the outfit ! I just adore this jacket, the whole look is gorgeous! I did an exclusive interview to Giampaolo Sgura, the photographer of last Dolce&Gabbana campaign!!!! don’t be shy I wait you on my blog!! this look is something fabulous! love the look! the colour of the shoes is amazing!! Looks perfect! I love all your outfits! and I really like when u go for bright colors! fell in love with that jacket when I first saw it too. Awesome! that jacket is beautiful and your hair looks awesome!! That jacket is gorgeous!! Also in love with that bag! Adore the sunnies and jacket. Love that jacket. You look so chic. I absolutely adore that PS1. It has been high on the wish list since the first time I saw it. Lovely jacket!!! You looked amazing! I’n in totally love with the shoes! *-* you look so pretty! Incredible Outfit Carolina…nice light in pics. stunning look Carolina~ you are so gorgeous and Mattias takes such wonderful pictures too!! That jacket is complete perfection. This must be the perfect outfit!! I love that you used the Wang skirt to make it more casual. That jacket is simply amazing!!! Is it the same that Chiara chose for one of her looks??? That jacket is a piece of art! That jacket is simply stunning, it looks elegant and regal as well as exotic. Love how you added brightly colored shoes to the outfit, anything else would have taken the outfit down! I loooveyour jacket and heals! amazing outfit! we totally love the shoes!! such a stunning jacket! beautiful! Looove your specs. Those I really need. So gorgeous, love the jacket! And those sunglasses are amazing! your jacket is just WOW !! LOVE those shoes!! fantastic color! I’m wondering what the name of your MK watch is. I’ve been looking around on the internet like crazy, but couldn’t find it. I’m slowly dying for your jacket….wow!! Carolina your ability to mix and wear colours so flawlessly is SO inspiring!!!! !